Our first subject is a Frater from the Mu Upsilon chapter at Illinois State University. 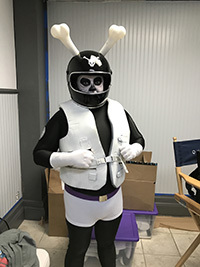 Zachary M. Thompson (Scroll 265) is a Chicago resident and most recently has contributed to Season 11 of “Mystery Science Theater 3000” on Netflix. TKE HQ: Tell us a little about your TKE experience? ZT: I attended Illinois State University and joined the Mu-Upsilon chapter in 1993. I served as Histor and Prytanis while there and led my chapter to a Top TKE Chapter award. I attended Leadership Academy VI and the Centennial celebration in Bloomington in 1999. From TKE, I took the values of Love, Charity, and Esteem and let them be the lens through which I saw the world. TKE HQ: That is quite a list of TKE milestones! So, how did you find yourself in the position to be a part of your current project? ZT: I majored in broadcasting when I left ISU and served as talent for a lot of the projects my fellow students worked on. They encouraged me to take classes at The Second City when I got out of college. TKE HQ: We should mention that The Second City is an improv school that opened its doors in December of 1959 and has since grown to become the world’s premier comedy club, theatre and school of improvisation—with live shows every night in Chicago, Toronto and Hollywood. ZT: I soon moved on from training at Second City to training at iO Theater, an improv theater in Chicago, where I still perform. TKE HQ: This all sounds like a great platform for your future on “MST3K.” Where did you go next? ZT: In 2001, I was hired by ComedySportz Chicago. There, I worked closely with several talented comedians. Among them were Tim Ryder and Rebecca Hanson. Tim and Rebecca met “MST3K” creator Joel Hodgson and developed a working relationship with him that led to their involvement with “Mystery Science Theater 3000” Season 11. Shortly thereafter, I won the comedy lottery. By that, I mean that Joel reached out to Tim and offered him a part, adding that he saw the role as two actors. He asked Tim if he could find someone who was physically his opposite. Lucky for me, Tim is well over 6 feet tall, and I am Chicago’s shortest working comedian. TKE HQ: Wow, that is an interesting mix of putting in the work, networking, and a dash of luck! With the cult following that “MST3K” has, that must have felt great to achieve. ZT: Working on “MST3K” Season 11 and the live “Watch Out for Snakes” tour has been a dream come true. TKE HQ: Wow, so you got to be part of relaunching a fan favorite as well as part of a live tour. I understand that was not a part of the original run. What is the most rewarding part of working on the show? ZT: Lucking into the canon of one of the most widely beloved comedy series of all time. Particularly among fellow comedians, this show holds a special place. TKE HQ: So, which episodes can we see you in? ZT: I am in the host segments at the top and bottom of every show, and in several host segments throughout. I am under a mask and makeup, but look for the shortest actor on screen and that’s always me. I was fortunate enough to write on two episodes: Yongary and the Loves of Hercules. ”Mystery Science Theater 3000” Season 11 dropped April 11, 2017, and is currently showing on Netflix. TKE HQ: Did you have to relocate for the show or are you working remotely? ZT: I was able to do it all remotely. I only worked two days of the shoot last fall. My contribution to the writing was entirely remote. TKE HQ: That certainly would make things easier. So, what is it like to spend a day in the life of a broadcaster/writer/ improvisator/actor? ZT: For the acting, it was all a blur. 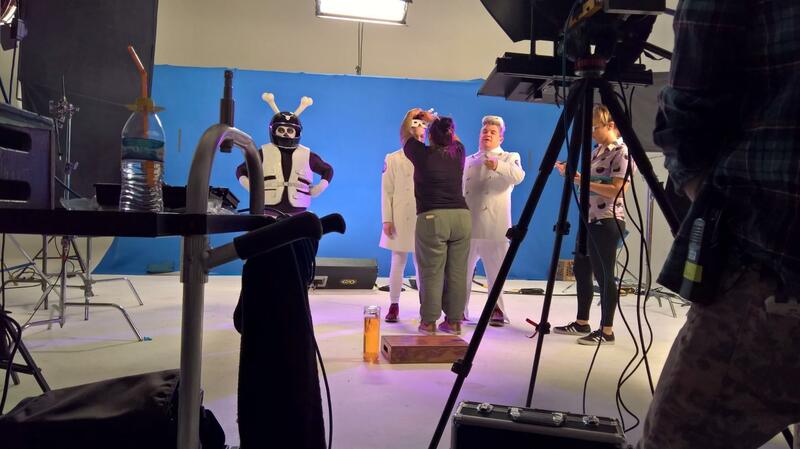 All my stuff was filmed over two days in Hollywood, and we would get there first because our makeup and costume was elaborate. Then we would stand where we were told until it was over. The writing is done via some proprietary software and you are isolated from the other writers when working. Watching it back, it’s hard to tell which jokes are mine, or derived from mine, or just a case where a few of us had the same idea. TKE HQ: Do you have any other ventures you are working on? ZT: I am still performing in Chicago at ComedySportz and at the iO Theater with the Improvised Shakespeare Company. Weekends that I am not performing comedy, you can see me doing commentary and in-ring interviews with Freelance Wrestling and Resistance Pro Wrestling in Chicago. TKE HQ: You have quite the varied resume. “MST3K” to wrestling commentator and back to improv comedian. So, what is your next step? ZT: Short answer: wait and see. I will keep performing, but it’s not up to me if Netflix decides to make “Mystery Science Theater” Season 12. If there are any Tekes out there in Netflix management, help a Frater out! TKE HQ: Speaking of fellow Fraters, any advice for them? ZT: This isn’t my quote, but “be the light in your interactions.” I have been working at comedy since 1998. This is the first thing I have done that has reached that scale. A good measure of my involvement is, of course, that I was what they were looking for, but being easy to work with and dependable are key. TKE HQ: How does it feel to have your work shared on a larger scale than you had previously achieved? ZT: It’s nothing short of a dream come true—particularly to be part of a show so esteemed (if you’ll pardon me). I hope everyone gets to see a dream realized like this. TKE HQ: Absolutely. So where can TKE Nation find out more about you? Any social media presence? ZT: You can find me on Twitter @PocketThunder.